On my first day in West Vancouver we set out to travel the West Vancouver sea wall and to get a feel for the community we would call home for the next week. 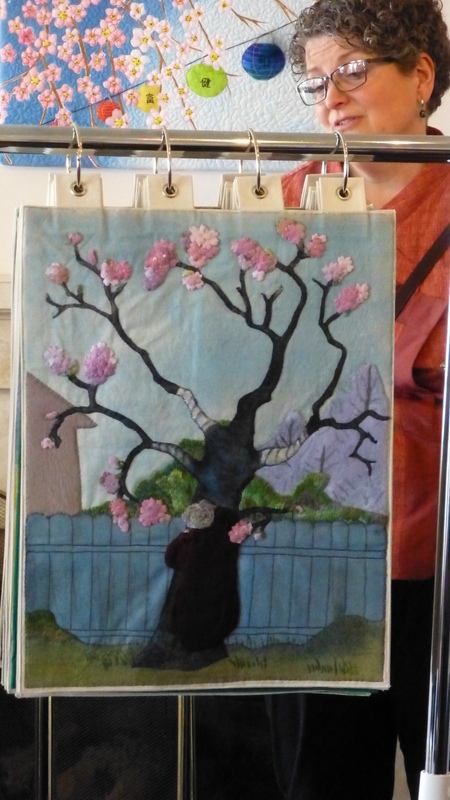 A friend alerted me to the proximity of the Cherry Blossom 2015 fibre art show and I was watching for the Silk Purse Gallery during my travels. 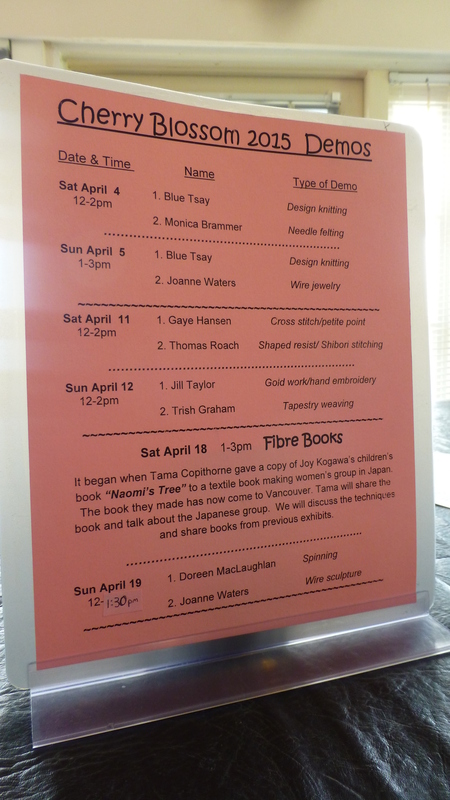 When I arrived at the gallery the organizers were setting up for the feature event of the week: A presentation about a fibre art copy of Joy Kogawa’s book ‘Naomi’s Tree’. Although I am familiar with other books by this author I had not discovered this delightful children’s book with it’s wonderful artwork by Ruth Ohi. 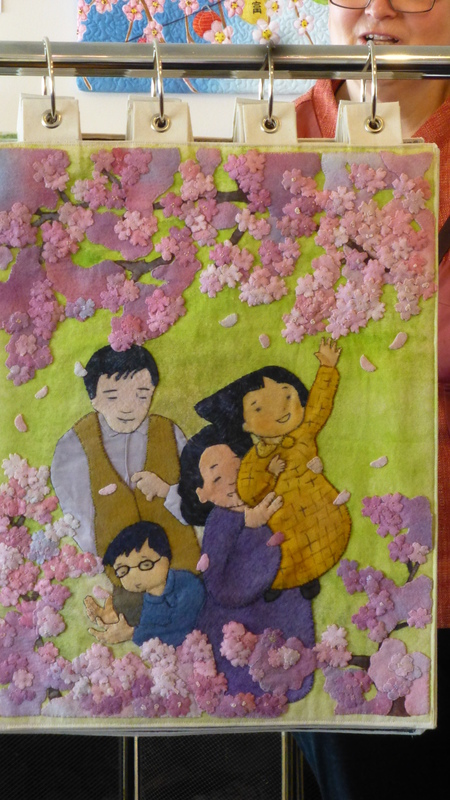 This wonderful piece of fibre art was created by a women’s group in Japan that recreates touchable books for children visiting their library. These women in Sue-Machi Japan have worked together for many years but when they were presented with an English language copy of this book by Tama Copithorne, they unanimously decided to use it as the basis for their next book project. Working almost exclusively with found materials they have appliqued, stitched, couched, dyed, painted and used all the techniques familiar to fibre artists in their effort to remain true to the original artwork of Ruth Ohi. But that wasn’t all! The book pages which were about 18 x 24 inches in size were created with tabs that held rings to support them from the frame. They were constructed on durable material that is meant to be touched! The book, the collapsible frame and the embellished carrying bag were brought to Canada as carry-on luggage in time for its appearance at this, and a series of upcoming shows. As each page was flipped for viewing by the audience, the story appeared on the page facing the narrator who read the story. At this show one of the organizers also showed the original art in the book so that the audience could compare and see how faithfully the artwork had been rendered. 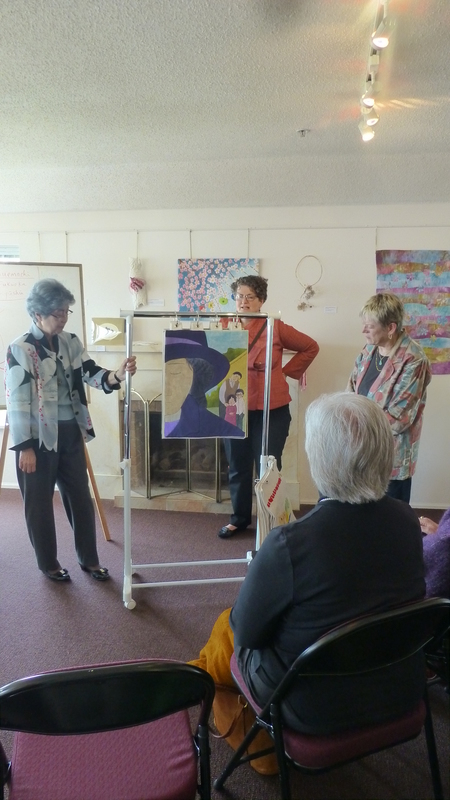 Tama Copithorne, the original book donor and liaison with the Japanese women’s group, was the guest speaker. She provided background on the group, their community focus and the story of the books creation. I felt very privilege to be able to attend her presentation and to contribute by taking photos. I was the only one present with a camera! 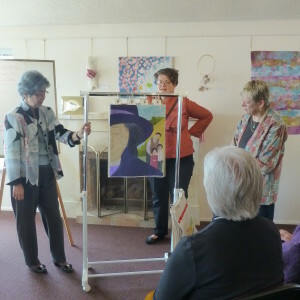 This presentation was supported by Historic Joy Kogawa House. 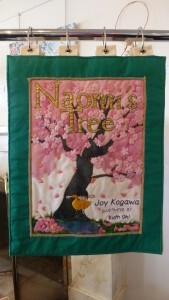 Ann-Marie Metten, the Executive Director was the narrator for the book reading and brought copies of Joy Kogawa’s books for purchase. 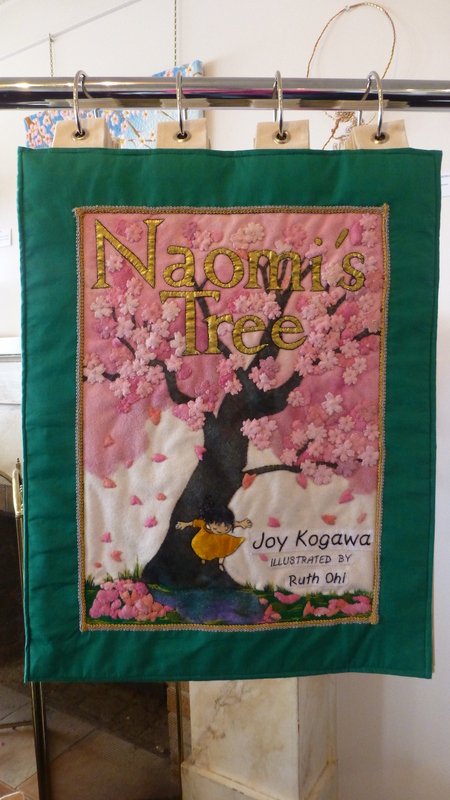 If you haven’t read ‘ Naomi’s Tree’ I suggest you find it at your library or, better still, purchase it for a little one in your life. I did! I would like to follow you by email, is that an option and I’m just not finding it? Luann, Sorry for the delay in getting back to you – life got in the road and I have been missing in action. Thanks for the heads up that I don’t have an email link. I’ll get my very busy webmaster son on to it when he has a moment! In the meantime can you mark it as a bookmark in your browser for easy access? or watch for post via Diane Duncan Art on Facebook. I had a site crash a while back and that seems to be something we overlooked in the rebuild. Just checked. Do you see the envelope symbol above the post? Also the link symbol? Not sure if that will let you auto download. Check it out.